Billy Bowlegs, a hereditary war chief (also known as Holata Mico, Halpatter-Micco, and Halpuda Mikko, all meaning "Alligator Chief"), headed one of the last bands of Seminoles to stay in Florida and fight U.S. authorities. He was born in the Alchua Savannah (present-day Cuscowilla, Florida) of full-blooded Seminole parents; his father was called Secoffee. It is said that his nickname stemmed from Boleg or Bowleck, the surname of a prominent trader. The common assumption that he was bowlegged from horseback riding cannot be substantiated. It is thought that Chief Micanopy was his uncle. Although he signed the Treaty of Payne's Landing in 1832, Bowlegs subsequently avoided the removal of his band to Native American Territory for over twenty years. 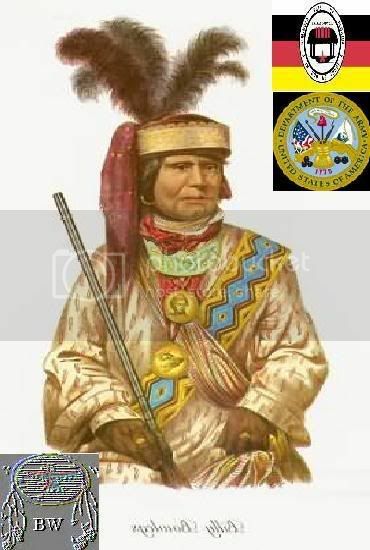 He was known as a skilled warrior; to be sure, he eluded the U.S. Army long after Wild Cat's, Osceola's, and other Seminole bands had been apprehended. Through an excellent knowledge of the Everglades, Bowlegs and his band maintained an independent existence unhindered by U.S. authorities until the eve of the Civil War. From 1835 to 1842, Billy Bowlegs was a significant leader in the Second Seminole War along with Arpeika, Osceola, Micanopy, Jumper, Wild Cat, and Alligator. Even after the death of Osceola and the surrender of Micanopy, head chief of the Seminoles, in 1837, Bowlegs and his two hundred warriors continued to resist removal to Indian Territory. On July 22, 1839, his name is mentioned in government reports relating to an attack on a Camp Harney. This raid was one of a series of successful forays against the army and settlers by Bowlegs, the new Chief of the Florida Seminoles. His guerilla tactics enabled him to secure, on August 14, 1842, a peace treaty that ended over seven years of hostilities. This eight-year war cost the U.S. government $30 million and fifteen hundred dead. To secure an enduring peace and impress Bowlegs and other Seminole chiefs with American might, a group of Seminole chiefs were brought to Washington, D.C., to see the power of the U.S. capital. As a result, from 1842 to 1855 a period of relative peace prevailed in Florida. However, a small group of army engineers and surveyors in 1855 invaded Bowleg's homeland in the Great Cypress Swamp, stealing crops, cutting down banana trees, and destroying property only two miles from Bowleg's main village just to see how he would react. This created what some have called the Third Seminole War. When the engineers and surveyors were confronted about their depredations, they proffered the Seminoles neither restitution nor remorse. Consequently, the Seminoles in southern Florida under Bowlegs launched two years of sporadic raids against Anglo trappers, settlers, and traders in the area. Settlers demanded that the U.S. Army mount a campaign to remove all remaining Seminoles. Containing the ravages of the Seminole militants once again proved difficult for the U.S. military. In 1858, a group of Western Seminoles that were under the leadership of Wild Cat and that had been removed to Native American Territory were brought back to convince Bowlegs and his followers of the wisdom of moving west. Bowlegs, upon hearing that Wild Cat was coming, stated, "Tell him not to come out to our country until I send for him." Bowleg was offered $10,000 and each of his followers $1,000 if they agreed to go to Native American Territory, but they initially refused, fearing harsh treatment in the West. Under enormous pressure, Bowlegs and 123 of his followers, plus 41 captives, finally agreed to removal in 1858. After his arrival in the West, Bowlegs became an important Seminole village chief in Native American Territory. At the start of the Civil War, he became a leader of the pro-Union Seminole forces (the Loyal Seminoles); his unit fought on the Union side in Kansas.